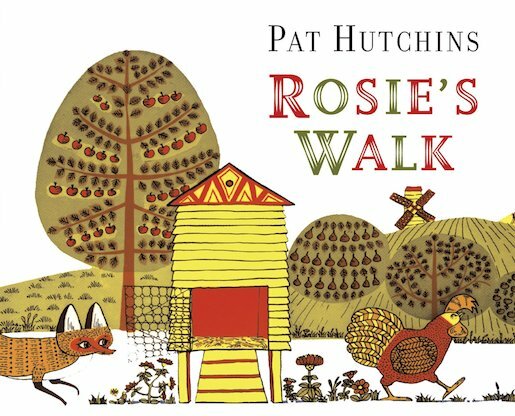 Rosie the hen sets off for a lovely stroll. But what’s that foxy shadow behind her? In this funny classic, the unique pictures are what tell the real story. With its folksy art style and witty use of pictures, this is one of those rare books you truly never forget. (Trust us, we know.) Rosie the hen sets off for a walk round the farm. So far, so boring. But look closer: there’s a wily fox behind her! Poor Rosie has no idea she’s in danger. Will she make it home again? Laugh out loud as the unlucky fox – who is shown but never mentioned – falls into a pond, gets chased by angry bees, and is buried in a haystack! The words tell one story – the pictures tell another! Colour Rosie and her farmyard friends.